The main window shows you the current state of the selected project. It also enables you to open and close your projects. All other windows can be accessed from the main window. The name of the selected project is displayed in the title bar of the main window. If the project is modified, this is also indicated with an asterisk (*). The main window can be shown in "Full" display and in "Compact" display, and you can even hide TimeTraces. More information on these display options can be read on the "Different display options" help page. You can change the display option via the main menu entries "View \ Full display", "View \ Compact display" and "View \ Hide TimeTraces". The color of the icon of the TimeTraces window shows you the current status of TimeTraces. More information on the icon status can be read on the "Icon status" help page. The activity that is being worked on (if any). The last column will show the value for the current date or time. The last column will show the value for a date or time you can select yourself using the browse buttons. All activities in the project and the time values for those activities. The number of columns shown can be chosen in the "Settings" window. Enabled activities (that can be used for time registration) have a green checkmark next to them; disabled activities have a yellow cross. If an activity is being worked on, it will be marked with a blue arrow. Key combination "Ctrl + Space"
Same as menu item "Time \ Start". Key combination "Ctrl + Shift + Space"
Same as menu item "Time \ Stop". Same as menu item "Time \ New time trace...". Shows you the status of TimeTraces, just like the icon of the TimeTraces window. The license information. If no license is installed, or if there is something wrong with your installed license, this will be shown instead. All activities in the project. Enabled activities (that can be used for time registration) have a green checkmark next to them; disabled activities have a yellow cross. If an activity is being worked on, it will be marked with a blue arrow. Shows you the total worked time on the selected activity in the selected view mode (current hour, day, week, etc.). The view mode can be changed via the main menu entry "View \ Time by ...". Same as menu item "View \ Always on top". Create a new project. Shows the "Project properties" window to set up your new project. Key combination "Ctrl + O"
Open an existing project from disk. Shows a window in which you can browse to the project file you want to open. Menu "Project \ Open recent"
Reopen a previously opened project. A sub menu shows you a list of recently opened projects. 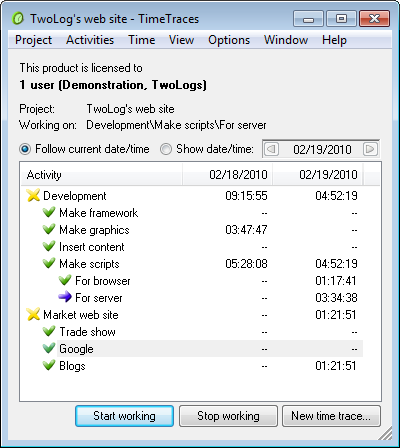 All projects that are already open in TimeTraces are flagged with a checkmark. The size of this menu can be changed in the "Settings" window. Key combination "Ctrl + S"
Save the current project. If the project is new, a "Save as" is performed instead. Menu "Project \ Save as..."
Save the project to a new location, making a new copy of the project. Shows a window in which you can browse to the location where you want the project to be saved. Key combination "Ctrl + F4"
Close the current project. If you are still working on an activity, you will be prompted to stop working on that activity first. If the project is modified, you are prompted to save the project first. Import time data from another project into the project. Shows the "Import project" window. Export time data from the project to another project. Shows the "Export project" window. Show or modify the project properties (name, location on disk, activity structure, working history). Shows the "Project properties" window. Menu "Project \ Generate report..."
Create a report of the project data. The "Generate report" window will be shown. Show the current totals of your time registration. The "Project statistics" window will be shown. Exit TimeTraces. If you are still working on some activities, you will be prompted to stop working on these activities first. If you have unsaved projects, you are prompted to save these first. Menu "Activities \ Manage activities..."
Manage the activity structure. Shows the "Manage activities" window. Start time registration on the selected activity. If you are already working on an activity, the time registration on that activity will automatically be stopped before the time registration starts on the selected activity. Stop time registration on the activity you are working on. Menu "Time \ New time trace..."
Add a new time trace. The "Time trace" window will be shown. Menu "Time \ Manage time traces..."
Manage the registered time traces. Shows the "Manage time traces" window. Menu "View \ Time by ..."
Changes the way the time values are displayed in the main window; they can be shown per hour, per day, per week, per month, per year or for the total project as a whole. In full display this setting is used for the columns in the "Activity" overview, and in compact display this setting is used for the time display next to the start/stop buttons. Menu "View \ Full display"
Show TimeTraces in full display. Menu "View \ Compact display"
Show TimeTraces in compact display. Menu "View \ Hide TimeTraces"
Hide TimeTraces in the notification area. Menu "View \ Always on top"
Makes TimeTraces display on top of all other applications, even if you move the focus to another application. Edit the settings. Shows the "Settings" window. Menu "Options \ Make portable installation..."
Start the portable installation creator. See the Portable installation help page for more information about portable installations. Menu "Window \ Previous project"
Key combination "Ctrl + Shift + Tab"
Select the previous open project (if any). Menu "Window \ Next project"
Key combination "Ctrl + Tab"
Select the next open project (if any). Menu "Window \ 1", "Window \ 2" etc. Select the given open project. The currently visible project is flagged with a checkmark. Modified projects that are not yet saved are flagged with an asterisk (*). Menu "Help \ How to use TimeTraces"
Show the TimeTraces help pages. Menu "Help \ Tip of the Day..."
Shows the "Tip of the Day" window with the next tip. Checks with the TimeTraces web site if new updates are available for TimeTraces. Shows information on how to license TimeTraces. Opens the "No license" window. Menu "Help \ About TimeTraces..."
Shows information about the version of TimeTraces. Opens the "About TimeTraces" window.